Specifically made for removal of solid lids with concealed pick holes. Lever action reduces lifting effort. 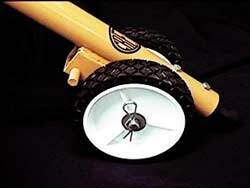 Over sized wheels for use on paved or smooth surfaces. Optional Swiveling Tripod can be purchased for use in rough areas. Quick Change-Converts from wheels to tripod in seconds. Easily carried- 3-1/2 foot long, 16 Lb. tool easily fits into car trunk or truck. Rugged Construction with replaceable hook. Safety orange for high visibility. Will safely lift covers up to 150 Lbs. Cretex Specialty Products, 2002 S. West Avenue, Waukesha, WI 53189. Tel: 262-542-8153; Fax: 262-542-0301.